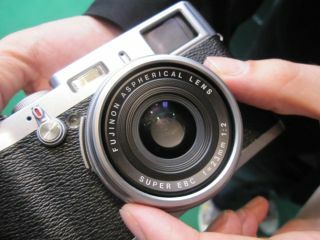 Fujifilm will release a firmware update for its FinePix X100 aimed at giving users more options and boosting the camera's ease of use, according to Tweets by representatives of the company. The Fuji Guys, who work for Fujifilm Canada and post videos to Youtube on getting the most out of your Fuji camera, have tweeted that the company will release a firmware update for the Fuji X100. The Fuji Guys report that the X100 firmware update will make 1/3 stop adjustments available in all modes and maintain the size of the AF area when switching between OVF, EVF and the LCD. Other updates include the ability to disable Red Eye removal when shooting raw, accessing the FN assignment menu by holding down the FN button for 3secs and the ability to exit the sleep mode by pressing the shutter button.